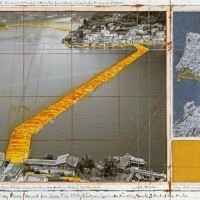 The exhibition dates for Christo’s new project in Italy have been announced. The Floati ng Piers will be exhibited from June 18 to July 3, 2016, weather permitting.The Floating Piers will reimagine northern Italy’s Lake Iseo for 16 days next summer, as nearly two miles of floating walkways extend across the water. Covered in shimmering yellow fabric, The Floating Piers will extend from the town of Sulzano to Monte Isola and encircle the island of San Paolo. The fabric will continue along nearly a mile of pedestrian streets in Sulzano and Peschiera Maraglio.Visitors will experience this temporary work of art by walking on the more than 50 feet-wide floating piers as they undulate with the movement of the waves and rise just above the water’s surface. The mountains surrounding the lake will offer a bird’s-eye view of The Floating Piers, exposing unnoticed angles and altering perspectives. More information at www.TheFloatingPiers.com. In addition to his new Italian project, Christo continues to make Colorado a priority of his international travel schedule. Christo has been invited to deliver a lecture at the Loveland Museum/Gallery on Thursday, November 12, 2015. He will present the latest information about all three of his current works in progress (The Floating Piers, The Mastaba and Over The River). Given the temporary legal interruption of Over The River, the June 2016 exhibition timing of The Floating Piers is ideal. It allows Christo to prioritize his work in Italy while the challenges against the agencies that approved Over The River continue through the legal process. This new temporary work of art will be completed, exhibited and removed while work on Over The River continues. More frequently asked questions about how Over The River relates to The Floating Piers are available here.